Don’t you just love an appetizer that comes together in a jif, looks impressive, and tastes great? We do too! Inspired by Shayna’s trip to Italy, here’s an easy and healthy take on a traditional Italian dish, polenta. We’ve spiced it up with a little red pepper flake and you can add some cheese if you wish, but no matter what topper you choose – it’s a wonderful bite. Not just as an appetizer, this polenta recipe can be nestled in some baby greens that have been dressed with balsamic vinaigrette, and make a great light lunch or dinner, too. The red pepper flakes make the mild tasting polenta, pop with just a bit of savory spice. Not only do they add flavor, but nutrition, too. Red pepper flakes have a compound called capsaicin in them. It puts the heat in chilies. It may lower the risk of skin and colon cancers. There have also been studies that show it helps people eat fewer calories. So if you do like a little heat, these squares are a perfect place to add the pepper flakes! Line a 13x9x1-inch baking sheet with parchment or aluminum foil. Bring milk, broth, and bay leaf to simmer in heavy medium saucepan. Gradually add polenta, whisking constantly until smooth. Reduce heat to medium-low and cook until polenta is thick, stirring frequently, about 10 minutes. Stir in red pepper flakes and cheese if using. Season to taste with salt and pepper. Transfer polenta to the prepared baking sheet. Smooth the polenta evenly over sheet to edges. Chill until firm. Cut polenta into squares. Remove the parchment and re-line the baking sheet. Preheat oven to 450F. Place the squares on the sheet pan. Put the pan in the oven and cook until the polenta is golden brown. Serve topped with roasted red peppers, mushrooms or goat cheese. Roasted Red Peppers: Toss thinly sliced roasted red peppers with a Tsp of EVOO. Mushrooms: Slice thinly, season with salt and pepper and sauté in 1 TB EVOO, until the mushrooms have released all their juice and the pan is dry. 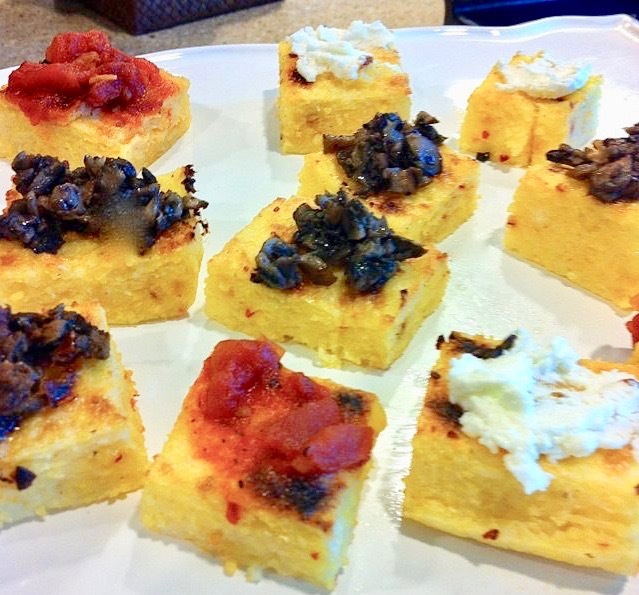 Goat Cheese: Spread about a Tsp of soft goat cheese on the top of the polenta squares.